Commercial real estate in Canada’s six major markets is, by and large, healthy, but Alberta continues reeling from the aftershocks of the oil sector’s plummet a few years ago, according to the National Dashboard Report by Colliers. Robust office space absorption in Vancouver is being largely driven by the technology, advertising, media and information industries, accounting for 40%, while education institutions are expanding throughout the metropolitan area and comprises 12% of the absorption. Colliers reported the vacancy rate dropped from 6.3% in Q2 to 6% in Q3. Education tenants, which figure transit access into location planning, rose from 35,000 square feet in 2016 to 300,000 Q3 of 2017. The National Dashboard Report also noted that Vancouver’s Broadway Corridor/Mount Pleasant area is flourishing with over half a million square feet of office space under construction or pre-leasing. Vancouver’s industrial demand is in strong demand, and the third-quarter vacancy rate in Metro Vancouver is 1.8%, down slightly from Q2’s 1.9%, and remains below the five-year average of 3.1%. Between the third quarters of 2015 to 2017, the vacancy rate has been under 2.5%, in part, because of restricted new supply. The Greater Toronto Area’s vacancy rate during Q3 was 5.3%, while the availability rate was 7.7%, both of which decreased from the second quarter. The average asking net and gross rates also decreased from the previous quarter – the net is $19.37 and the gross $37.18, and the rates increased downtown and in the GTA West, which have the region’s highest office concentration. The investment market also had an extremely healthy Q3 showing; sales volume rose by 29% since the previous quarter, totalling slightly below $1.8bln. 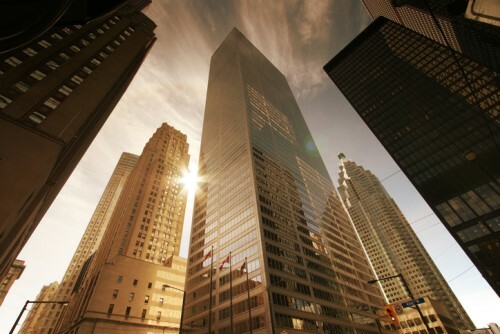 Scotia Plaza sold its remaining stake for $681mln, and 777 Bay St. sold for $398mln. The city’s industrial market had strong leasing during the third quarter of 2017, with positive absorption in three out of the GTA’s four markets, for a total of 1,820,301 square feet. GTA West experienced the largest decrease in availability rate, down 0.7% from Q2, for a GTA-wide availability rate of 2.3%. Sales in the investment market averaged $132 per square foot, and 2.8mln square feet of additional space expected within a couple of years. Monreal is flush with new developments, like the Humaniti tower at 1030 Rue de Bleury, and Maison de Radio-Canada, but there will be considerable vacant office space in the business district, resulting in strong need for Class-A property investment if the intent is to compete and retain tenants. Prestige Class-A office buildings sell at cap rates in the 5-5.75% range. SNC Lavalin just completed a 20-year- sale-leaseback of its Blvd. René Lévesque Ouest headquarter. The Collier report also stated that investor appetite for office product in Montreal’s downtown core remains voracious. The industrial sector’s vacancy rate in Quebec’s largest city is on a downward trend, as it concluded the third quarter at 4%, while the availability rate was 6.6%. Well-leased, modern industrial facilities in Montreal are in high demand and short supply, putting upward pressure on price points, especially as REITs and institutional investors bid competitively. The National Dashboard Report stated that purchasers said they expected top industrial properties to yield between 6.5% and 7%. Montreal has seen substantial growth in its artificial intelligence sector – and by extension, optimism for the city, as it’s a globally-renowned AI development hub. Canada’s second-largest city is also home to the world’s biggest community of deep-learning researchers, believed to be close to 250, who are associated with the French associated with Université de Montréal and McGill University. The nation’s capital is devoid of Class-A space, and that’s left Class-B properties picking up the slack. Large tenants in the technology sector still opt for Ottawa’s downtown, leading to Colliers to speculate that there could be tech boom on the horizon. Ottawa’s industrial sector is presently short of smaller space with quality loading features, and Colliers wonders whether or that will slowly, but surely, raise price points. There’s also a dearth of industrial space in the neighbourhood of 10,000 square feet that has adequate height. Ottawa’s east end continues to boast the best combination of location and space, and the Deep East and West both present ideal conditions for developers. The oil industry’s decline has had lasting shockwaves in Calgary, where downtown office leasing activity remains cowed. That was likely been exacerbated by the summer, a typically quiet time of year. However, AA- and B-Class absorption during the third quarter was strong, resulting in 138,000 square feet. Since 2012, Q3 was only the second consecutive quarter with positive absorption, bespeaking the potential for economic growth. Calgary industrial sector is riding a high, as vacancy continues declining. Four consecutive quarters of positive absorption totalling 2,413,238 square feet have reignited the development of multi-tenant buildings. In tandem with minimal new supply going back six quarters, developers are moving along with project phases. The report surmised that the vacancy rate will keep trending downward through the end of the year. Edmonton’s office absorption rate during Q3 was -35,919 square feet, for an 11th straight quarter of negative absorption. However, the Albertan capital fared worse in this regard during the first two quarters of 2017. While the vacancy rate has slightly decreased, it is only because of building conversions, but that number is expected to climb with the Stantec Tower in 2018 increasing inventory. In Q3, industrial vacancy in Edmonton dropped to 7.7% from 7.8% in Q2, and the region had a positive absorption of 146,364 because manufacturing, storage and warehouse activity in the city’s southeast are strong. However, the surrounding areas dipped in Q3 absorption to 93,853 square feet from 176,682 in Q2, but Colliers allayed concern by pointing out the province’s oil and gas sector are rebounding with the production and exports of crude oil increasing through the first half of the year. Moreover, manufacturing, retail, sales, exports and housing construction had solid recoveries from their lows a year ago.